The High Five from the Ready Player One poster. Correction: Despite his own quotes to the contrary, Steven Spielberg told Fandango Friday that Disney did allow Star Wars references into Ready Player One. You can listen to him talk about it below, followed by the original article. 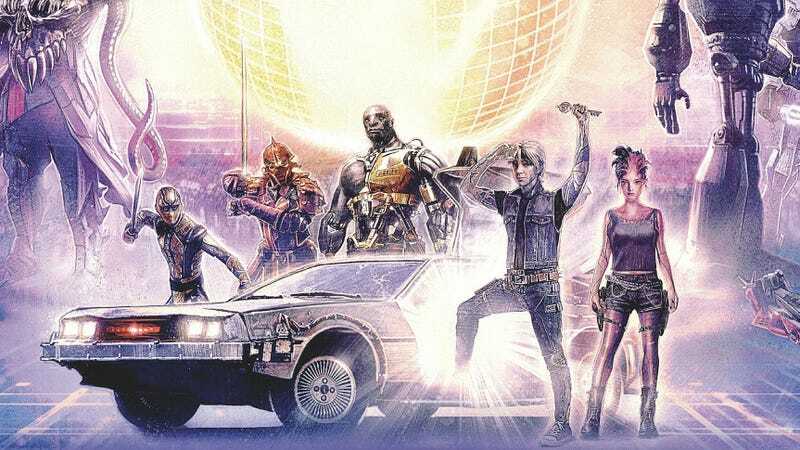 From Back to the Future and The Iron Giant, to Akira and The A-Team, Ernest Cline’s Ready Player One is absolutely jam-packed with pop culture references. However, despite the efforts of arguably the most famous and powerful director of all time, one kind of big property isn’t in the movie adaptation. “They” being Disney, of course, which bought Star Wars from Spielberg’s pal George Lucas in 2012 for $4 billion. (io9 contacted Disney for comment and will update this post if we hear back.) Still, the director suggested that his licensing team, lead in part by producer Kristie Macosko Krieger, worked for years to get access to as many licenses and characters as they could. Besides Star Wars, another franchise they couldn’t get was Ultraman. The Japanese superhero plays a huge role in the end of the original Cline novel but is basically replaced in the film by The Iron Giant, which is owned by Warner Bros., which is distributing Ready Player One.